Our book, is now available for sale. Eighteen women co-authors, all first time writers. 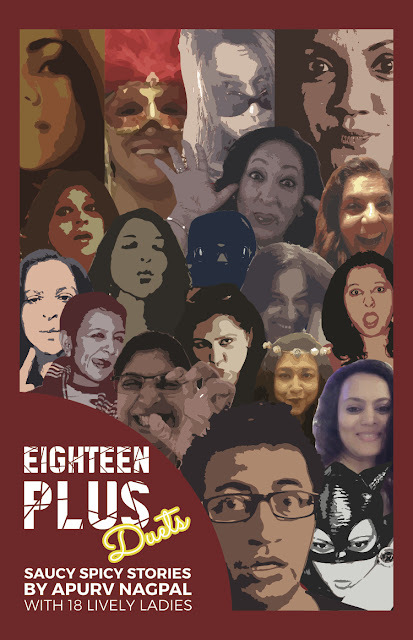 Eighteen Stories - sizzling, spicy, saucy, like the women. Launches planned in Pune (Sep1), Delhi (Sep 17), Mumbai (TBC). India's most ambitious self-published book needs your support, love and care. Likes & comments are welcome but we need you to buy and share. 💰 a wise man once said, "money shall follow" Amen! Certain foods with aphrodisiac qualities help men and women perform better. 1)Cocoa : Chocoholics rejoice, the antioxidants in cocoa, known as flavonoids, increase blood flow resulting in better erections. Dark chocolate contains in abundance. 2)Red Wine : Antioxidants in it help improve blood flow. 3)Oysters : Oysters boost zinc, a mineral that helps produce testosterone and helps regulate both men and women's sexual function and libido. They are also packed with nutrients. 4)Nuts : Nuts, such as pistachios or walnuts, are more than just a good snack. Walnuts contain arginine, which is used to make nitric acid, thus increasing sexual function. 5)Garlic : Having garlic breath might seem like a mood killer, but the bulb is extremely high in allicin, which improves blood flow.